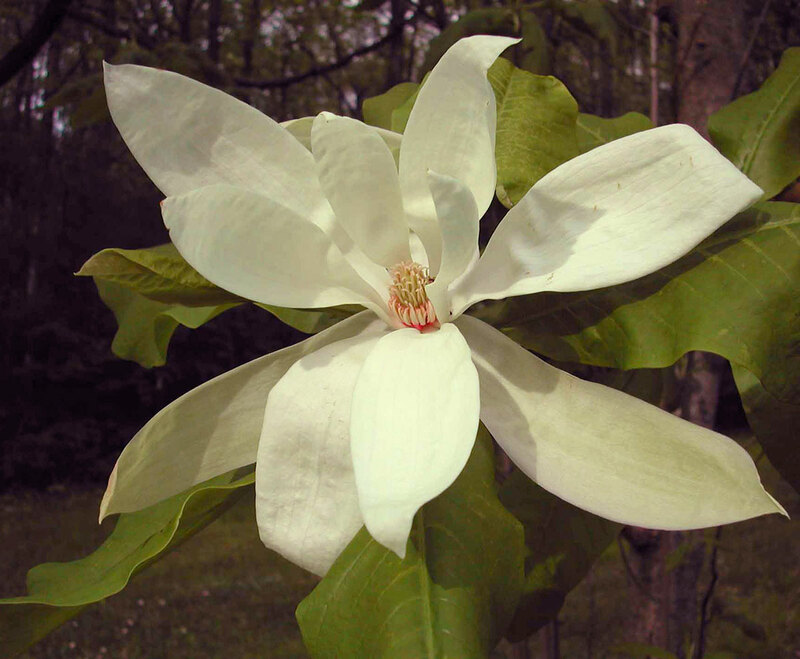 Trees with improbably big leaves and intensely fragrant flowers define Magnolia Glade. Hardy magnolias from the Appalachians, Asia, and ornamental hybrids among them form the collection’s framework. The largest leaves belong to the umbrella tree (Magnolia tripetala) and the bigleaf magnolia (M. macrophylla). The dramatic yellow, pink, or white hybrids of the late Dr. Savage have been added since they are an important part of twentieth-century contributions to society by Michigan citizens. Also here are the native and Chinese tulip trees—the only two species of Liriodendron to survive the glaciations over the last several million years. The largest tulip tree likely represents a presettlement population since it predates the Arboretum, and it is unlikely someone would have planted it at this site in the 1800s. Magnolia Glade is a warm and moist microsite—it has growing conditions that are less harsh than the average for our area. That is why the magnolias are so successful here. There is underground moisture that seeps through the loamy soil rather than forming a stream at the surface. Likewise, the cold air of early and late frosts continues downhill to the Huron River rather than collecting here and damaging the trees. Using microsites to their best advantage is an important element in ecologically responsible horticulture. Magnolia Glade is at the Nichols Arboretum site.